Still feeling like an IDIOT because you bought some Coronado beer without checking that brewed on date that read 3/26/10? It happens to all of us now and then...I bought some Sweetwater IPA last night (yeah, I'm out of town again) and noticed the enjoy by date of 10/10/12 when I got back to my hotel room. I had to console myself with the Founders Harvest and Westbrook Nelson Sauvin that I also purchased. Well, have no fear about that happening again with Coronado beer (at least I hope! 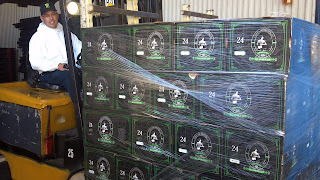 ), as they have changed distributors from National to Premier, which promises to give Coronado a push in our market that they hadn't received before. In the picture you can see my new friend Miguel (I call him Miguel because of the M on his hat...must stand for Miguel, either his name or in honor of Miguel Cabrera, right?) unloading the first delivery of Coronado to Premier's warehouse. To celebrate the arrival, Coronado Crossing restaurant is hosting a Coronado Brewing tap takeover on Friday, 10/26 (you know the place- on Montgomery west of San Mateo, used to be Harrigan's way back in the day with the good fried zucchini, then Zea Rotisserie, or as I call it, Boston Market for rich people). I haven't been in there yet, but if they keep pouring drafts like the following, you can bet I will drive right by on my way home to drink soon! Coronado Brewing's Orange Ave Wit, Islander IPA, Mermaid's Red, Idiot Imperial IPA (never saw this on tap, very excited that it's here), and Blue Bridge Coffee Stout, which is brand new to New Mexico. So come on out to Coronado Crossing for some Coronado beers...and grits. Yes, they have grits on the menu, but I refuse to call them Waffle House for rich people. Absolutely refuse. don't you mean Friday the 26th? if so, many many things going on...gotta get a photo op with Woody the keg-on-wheels from Deschutes Base Camp at Billy's then Bosque opens. probably won't have a pint at Billy's, just want the live photo, then maybe head over to Coronado for a fresh Idiot. then to Bosque. Thanks Patrick for the heads-up. Sorry, missed a day due to no sleep and travel and I keep getting it wrong! Thanks for the correction.